If you haven’t visited Malta, it would be easy to dismiss it as a place worthy of missing simply due to its size. However, to do so would be a great injustice, both to this wonderful country and to you, as a potential visitor. There is nothing difficult about travelling here. My suggestion is to stay at least one week so that you can spread yourself across the island, but it’s also the perfect place for a long weekend. From our hotel in St Julian’s, we did a day trip that covered Mdina, the Dingli Cliffs, Marsaxlokk and the Mnajdra and Haġar Qim Temples and the Blue Grotto. The brightly coloured fishing boats, called Iuzzus, bob up and down on the harbour, their brightness only matched by the vivid colours of the doors and windows on the stone buildings that line the road nearby. Marsaxlokk has always been a traditional fishing village, and despite a downward trend over time of both inhabitants and fishermen, the industry remains an important one. The action happens at the start of the day here, so if you want to get a taste of the real Marsaxlokk, be sure to arrange to get here early. 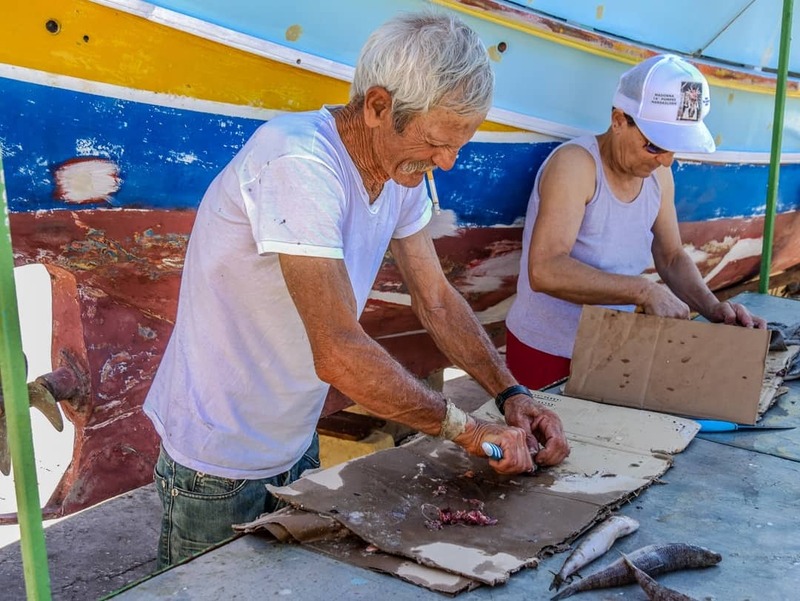 In doing so, you’ll be rewarded with the fishermen unloading their catch from their boats and cleaning the fish. You’ll also witness them doing all-important maintenance work, both on their boats and at the dock. At any part of the process, they are happy to have a chat and tell you all about their fishy haul, just like these two did when we stopped by. It’s almost as though Malta has been perfectly described in this village, and you can get it all in one picturesque gaze around the harbour. The boats are a standout on their own, but they carry so much more untold significance than just being brightly decorated. Every boat has eyes! Yes eyes! At the front of every vessel, an eye is painted on both sides. The legend of the eyes is largely superstitious. It is said that the eyes form part of Phoenician folklore and represent the Eye of Horus, their god of protection. Placed on the boats, they are a symbol of health and protection, ensuring that the fishermen are kept safe whilst out at sea and ensuring a safe return. The eyes are also part of Vietnamese culture and tradition for similar reasons also. Sundays are the best for visits to this village. Local markets also line the waterfront. Whilst some is touristy souvenirs, there are some beautiful lace tablecloths and other crafts on hand. The sunsets are epic at the Dingli Cliffs, so I’m told! Due to the timing of our day trip, we weren’t able to witness this, but I’m quite sure they are right. At 220 metres above sea level, the Dingli Cliffs tower above the ocean below. In some locations the rock slopes more gently down to the water, but in others, it’s a sheer drop straight down. 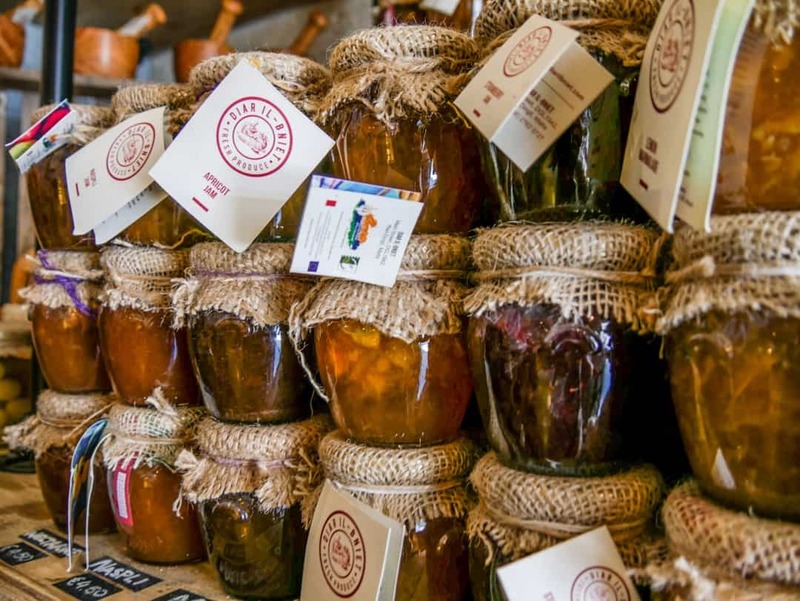 The village of Dingli includes about 3,000 people, who mostly make their money off the land, growing their own produce and selling at local markets. Only 11km from the Blue Grotto, the island of Filfla can also be observed from here. With a commanding view over the water, the Saint Mary Magdalene Chapel has pride of place at the top of the cliffs, marking the highest point. The narrow inlet at the bottom of the walkway was heavily congested with the brightly coloured boats, prominent in these Maltese waters. Lines were forming at the water’s edge as drivers jostled their boats in to thrust another group of tourists into their boats. There’s no time to think about the best place to sit or to ask a question and there’s certainly no safety briefing, despite the fact that for 20 minutes or so you’ll be out in the open water. Thankfully, there are at least life jackets to put on. In a flash, we are whizzing off, as fast as the little two-stroke motors could go. The Blue Grotto was my least favourite part of Malta. Living up to the hype was always going to be difficult. 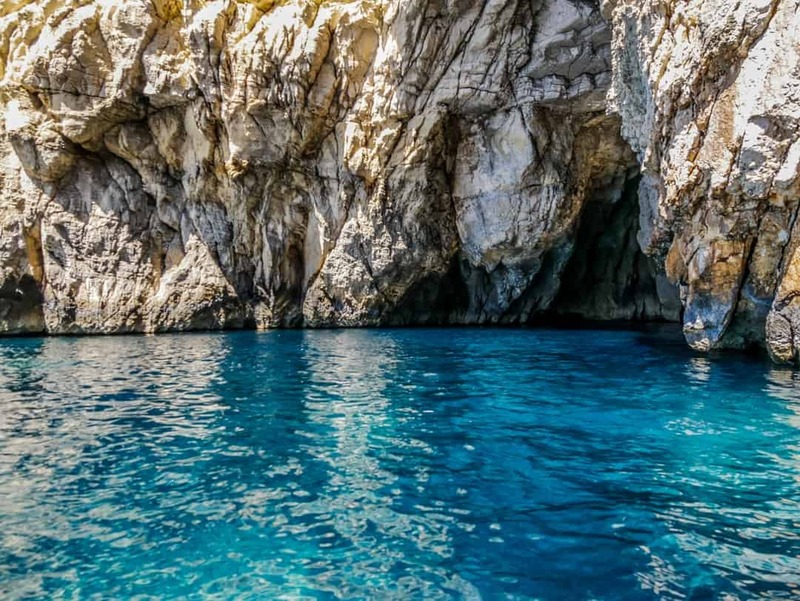 A series of sea caves forged into the limestone rocks, with clear blue and emerald green waters provide the backbone of what is referred to as the Blue Grotto. It is located on the southern coast of Malta, opposite the desolate island of Filfla, a haven of marine life for divers. The coastline, with its craggy rock faces and caves, is spectacular, but it would have been wonderful to have just a little commentary from the boat driver. Better still, it would have been fantastic for him to take his hand off the throttle, and allow us to actually see the caves properly and get to gaze into those crystal blue waters for more than a few seconds. Unfortunately, they are persuaded only by the thought of another boatload of customers paying €8 each for the pleasure of their company. Time is money as they say and the notion of customer service or ensuring that this beautiful part of Malta is appreciated goes unnoticed. If seeing the Blue Grotto is still your thing, be sure to check the weather as access to them is only possible when the weather is behaving itself. For details on how to get here click here. Located high up on the dramatic southern Maltese coastline, in between the Blue Grotto and the Dingli Cliffs lies the archaeological area containing the Haġar Qim and Mnajdra Temple. A trip here during summer is hot, and unless the sea breeze is blowing, it can be quite uncomfortable so be sure to bring water, good walking shoes and a hat with you. These temples have become a very important part of Malta’s tourism offering and a visitor centre now provides a very good exhibition/museum of artefacts. It also gives some insight into the traditional engineering methods that would have been used to build these enormous stone temples. The Haġar Qim temple sit just outside the visitor centre, whilst the Mnajdra temple is a bit of a walk away. Whilst only approximately 500 metres, it’s all downhill, meaning that it could be difficult for some people to get back up, especially in the heat. The visitor centre runs a buggy that will bring you back up for a minimal cost. The temples are now covered with sun shades in a bid to reduce both the impact of the sun and the natural erosion caused by the prevailing ocean winds. In the Haġar Qim temple, the largest stone of any Maltese temple can be found. Weighing 20 tonnes and measuring 6.4m long by 3m wide, it’s a beauty. Mdina was a special place to visit. If the streets of Valletta and its surrounding suburbs were crazy, Mdina was at the complete opposite end of the spectrum. Known as the Silent City, for good reason, this hill-top city and its narrow, stonewalled laneways are just a delight. It’s still a tourist drawcard, but hop off the main street and into the laneways and take your time meandering through the buildings full of stories and history. Today, only around 300 permanent residents live here, mostly aristocrats and nobility. Palatial homes line the streets and are handed down through the generations. Not surprisingly, a church built by the Knights is found inside the walls, it’s dome the only real part of the city that can be seen above the walls. Inside, the church is elaborately decorated, as are most of the other Maltese churches I’ve witnessed. Inside the dome was particularly stunning. The floor was where the beauty also lay, with incredible marble tiles used to identify the tombs of nobles and priests. The tiles cover every part of the floor and we even saw one “ready” for the next priest. Located nearby the Dingli Cliffs, we ate at Diar il-Bniet, or “House of Girls”. In a former farmhouse, founder Dorianne Kurtcu Mifsud brings her farm to plate philosophy to those who dine here. Inspired by her grandmother who would cook up hearty meals for the family, traditional Maltese food made on the produce from their farm is the cornerstone of this restaurant. A fresh batch of homemade lemonade sits up on the bench near the kitchen, and our guide Maria instantly orders us a glass. “It’s beautiful”, she says, “all lemons are grown on the farm”. If you are looking for traditional food, this is one of the best places to come in Malta, with everything grown locally on the family farm. The platter of antipasti or Hobż tal-Bidwi was a meal in itself. It’s certainly great for sharing. The board consisted of traditional bread, round in shape and cooked in a wood oven. Accompanying it were water biscuits, caponata ( a blend of green peppers, aubergine, onion, garlic and capers), broad beans fried with garlic, fried zucchini, olives, sun-dried tomatoes, bigilla (a dip made from dried beans) and gbejna, a fresh sheep cheese. It was delicious! Tip: If you are planning on visiting Diar il-Bniet bookings are essential. It is an intimate restaurant with only a small amount of seating, and is very popular. Sure enough, half a rabbit turned up not long after. It’s not a pretty dish to look at but it’s hearty and full of flavour. The boneless chicken was a little more modern looking and was equally yummy. 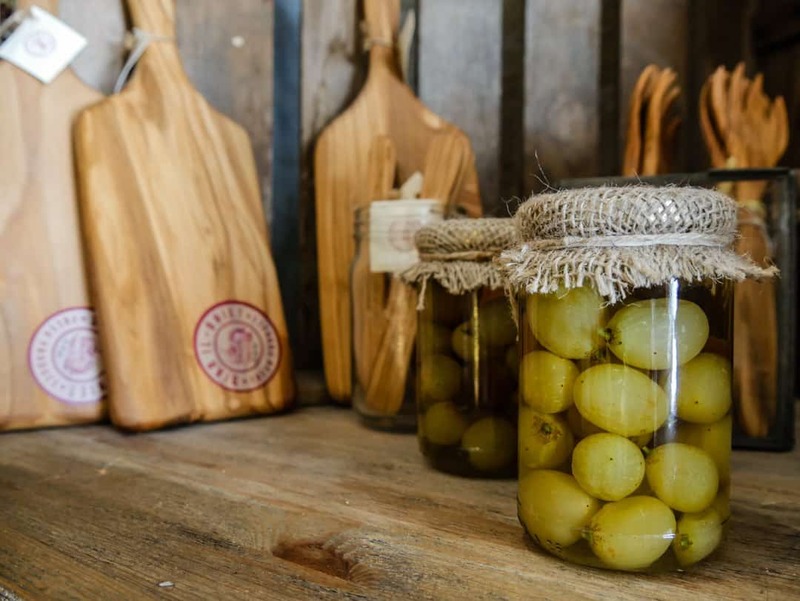 An on-site farm shop also provides an opportunity to take some of the beautiful food back home. We stayed at the Hilton Malta in St Julian’s, within a short drive of Valletta, the nation’s capital. Public transport is also accessible from here and there are many dining options nearby.